Tuck these compact 3-Drawer Chests into the nooks and crannies of your home and make the most of every cranny. Hand-woven, these paper rope chests are sturdy and beautiful, with a winsome charm that turns any space into an instant haven. Keep one in the bathroom for linens, towels, and extra rolls of paper; place a bowl on the open top shelf filled with washcloths and soaps for a stylish and practical flourish. Place one in the hall or closet to store scarves and gloves, magazines, or anything else! Bring a little understated elegance to your world with these chic black chests and keep it all in order. Hand-woven, paper rope 3-Drawer Unit. Open top shelf. Finished with a chic black stain and protective coating to prevent mold and mildew. Humidity tested. Dimensions: 26. 4" H x 16. 9" W x 10. 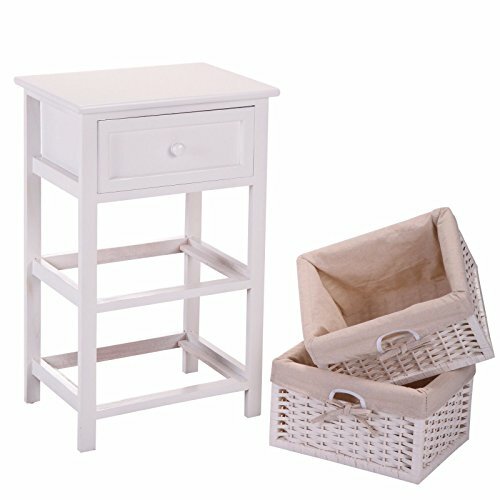 6" D.
Inspired by the simple lines of American Country furniture, this pretty and practical side table with distressed white finish and rattan weave drawers exudes a casual coastal sensibility. Crafted of pine, this piece is a charming storage solution. 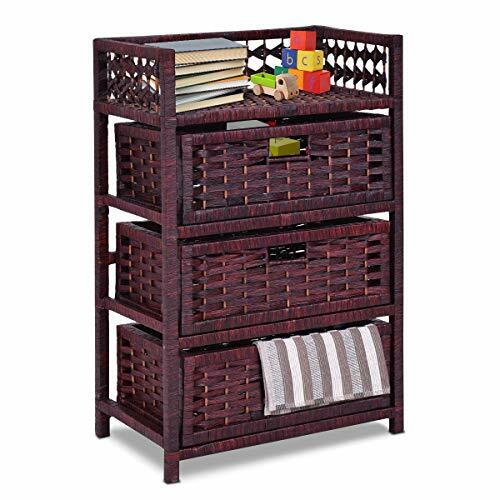 Simple with plenty of storage for this Omaha Storage Rack with Foldable Baskets. Choose from 2, 3 or 4 baskets rack set. Baskets open size is 13.98-Inch Width by 10.63-Inch Depth by 7.48-Inch Height and Folded size is 23.03-Inch by 9.84-Inch by 1.97-Inch. 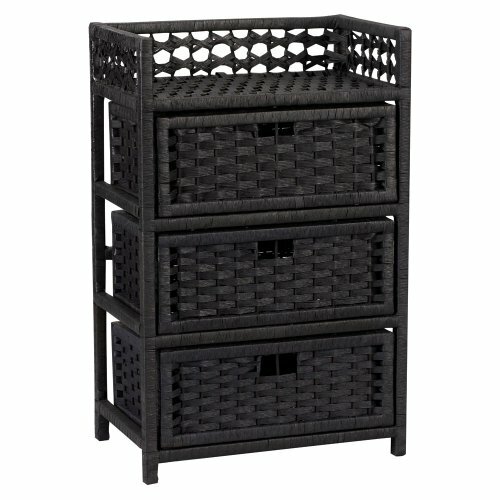 Overall 3 Baskets Storage Rack size is 16.73-Inch Width by 12.40-Inch Depth by 28.54-Inch Height and finished in Black color. Rack is made with combination of solid and composite wood. Basket is Corn Husk. Assembly Require. Feeling creative? 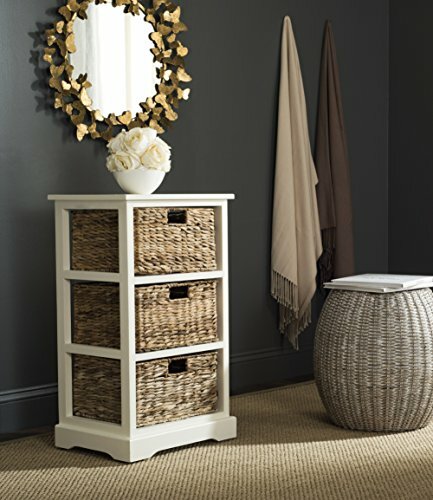 Add this soft country wicker chest to any room in your home for an attractive storage option. 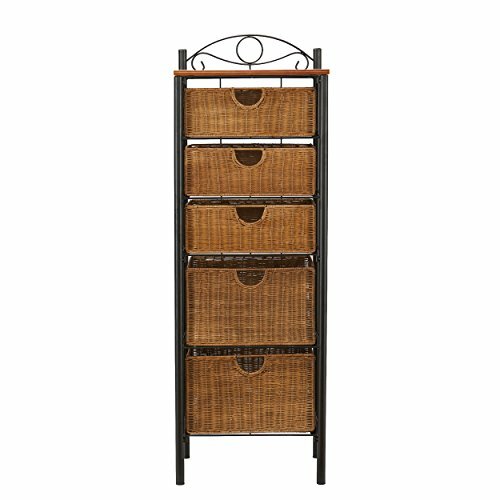 The sleek black metal frame holds six caramel-colored wicker baskets, ideal for blankets, clothes, or even pots and pans. 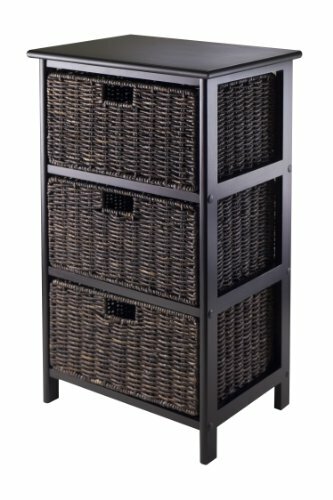 Spacious wicker countertop displays small kitchen appliances, bath toiletries, or entertaining ware; consider placing this cute storage chest in your kitchen, dining room, or laundry room for functional storage with panache. 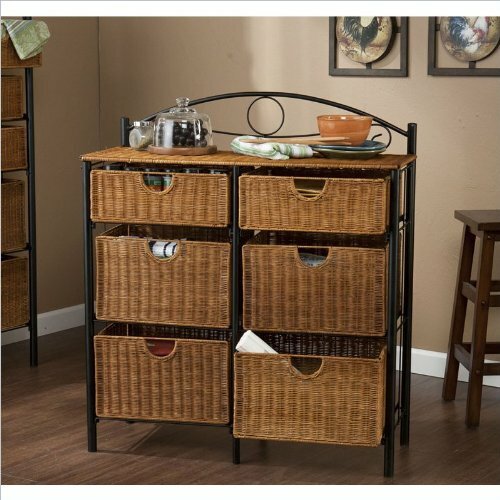 This "goes anywhere" storage center features elegant wrought iron scrolled details and a spacious wicker countertop. Dimensions include: Overall: 34" W x 13" D x 38.5" H; Top surface: 33.75" W x 12" D; Baskets (top): 14.25" W x 11" D x 5" H; Baskets (middle/bottom): 14.25" W x 11" D x 8.75" H; Clearance: 4" H. This one-of-a-kind item approximately weighs 38 pounds and supports up to: top 20 lb., each basket 10 lb. Only quality materials and manufacturing will do. Product materials include: Materials: Round tube steel, wire, wicker. Assembly required. Made in China. Solid pine top finished in brown color. Rich black finish metal. Three tools less folding drawers. Clean with a dry non abrasive cloth. Made from decorative metal frame with woven corn husk. Made in China. Assembly required. 18.3 in. W x 13.7 in. D x 26.2 in. H (17 lbs.). The Farmington three drawer maize weave chest lets you add that needed storage in style! 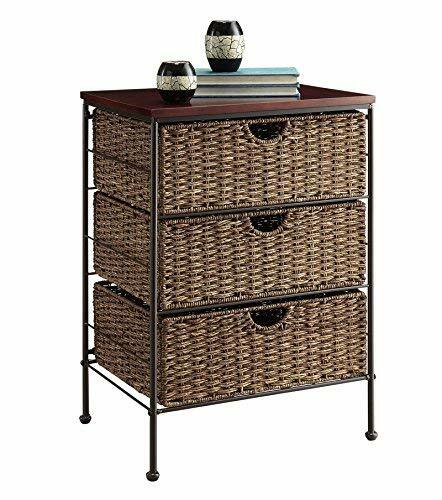 The chest comes with hand crafted, flat packed drawers that are quick to assemble, which are woven over a metal frame to give them the strength needed to support your storage needs. The three drawers rest on a metal rail on the frame and come with a stop on the back. The contoured drawer fronts allows the drawer to open with ease. The added solid wood top is great for displaying your favorite pictures, vase of flowers, etc. 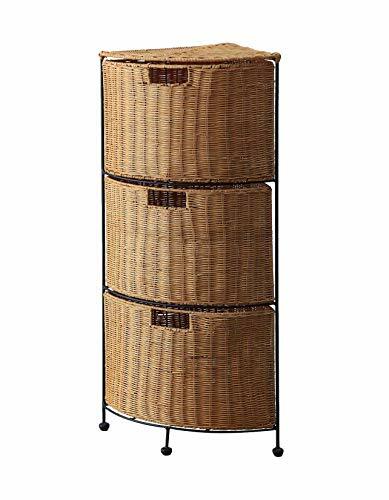 Constructed of metal, maize and wood. .
Shopping Results for "3 Drawer Wicker Storage"